Germany's Sulphur Aeon go bigger and better for this, their second album of Lovecraft-themed death metal. Still best summed up as somewhere between Vader and Incantation in style, and still bearing exactly the sort of majestic cover artwork that this sort of music requires, Gateway to the Antisphere is a worthy follow-up. The Lovecraftian atmosphere is restricted mainly to the intro and outro pieces – especially intro ...To Drown This World, ominous booming and creepy whispers, before a hysterical voice starts shrieking about what he has seen atop crunching riffs – but it's effective for all that, and the murky death metal that pounds out between speaks for itself. It's a pleasure to hear that Gateway to the Antisphere has a better production that its predecessor, less like listening to the album actually underwater but keeping the melodic and epic edge notable previously hightlighted. First track proper Devotion to the Cosmic Chaos is a good mixture of blasting chaos and slower, more melodic grandeur, opening the album well with a sound somewhere between Nile and Hypocrisy. As the album continues, the variety becomes more notable; Titans suggests a darker, more death metal-oriented Melechesh, for example, while the following Calls From Below beats the listener in the face with pounding drums atop guitar lines snakily caressing, something like older Behemoth. He Is The Gate has initial tech-death influences before turning epic, while Onwards... Towards Kadath has a touch of black metal to it. Into the Courts of Azathoth goes all out epic melodic death, and is probably the best song that Sulphur Aeon have ever written, let alone the best song here. 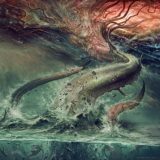 It's not a perfect album – the opening to Abysshex seems a little too inspired by Behemoth, although that just might be my latent wish that death metal bands would start looking elsewhere for inspiration. Yet the bubbly noises that open Diluvial Ascension – Gateway to the Antisphere are an excellent touch, as is the doomy descent towards the end of the track – that sort of experimentation works well within these confines. Already, it's a massive step forward from Sulphur Aeon's début, but it's hard not to think that the band has ever further to go in developing their sound. That it's this good already is only a compliment to them, however.